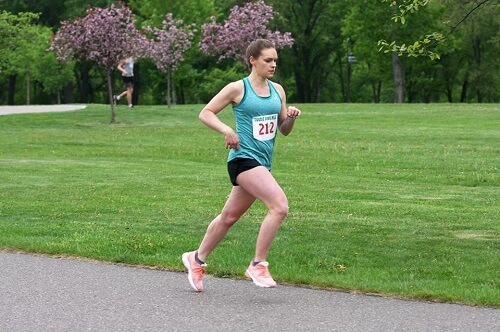 Last weekend I ran the Foodie 4 Mile, a race to celebrate the opening day of the Minneapolis North East Farmer's Market. It was a beautiful perfect morning for running, about 49 degrees and cloudy. I like the cooler temperatures because then I don't overheat. I ended up beating my time from last year by 6 seconds which was a surprise because I recently took a little time off from an injury and didn't feel like I was in as good of shape as I normally am this time of the year. It went really well though, and I was glad I did it. I just prayed before the race that I would feel good and go well, and it did! They gave out reusable totes with coupons to the farmer's market, so we had to stop there after and browse around. I love farmer's markets, but I don't get there often because usually I work on Saturdays and am busy on Sundays, so it is packed up by the time I would get there. But it was awesome to be able to visit right after the race on the way home. They had surprisingly a good amount of produce for this time of the year. 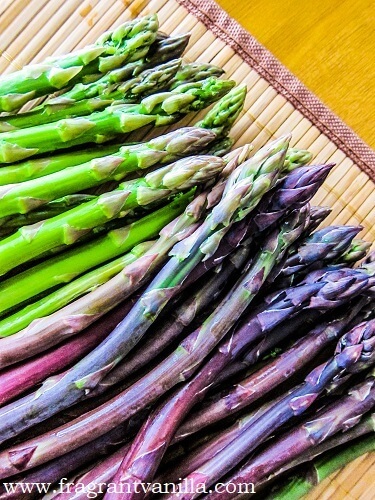 I bought some beautiful asparagus, purple and green. Since it is so good this time of the year. I thought it deserved to be used in something delicious. 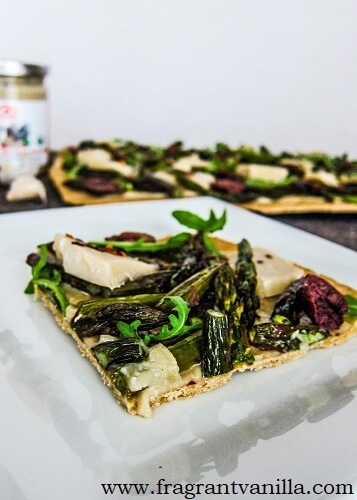 I usually would just roast it with a little olive oil and sea salt and eat it like that, but I decided to use that roasted asparagus to top off a flatbread. It just sounded good. 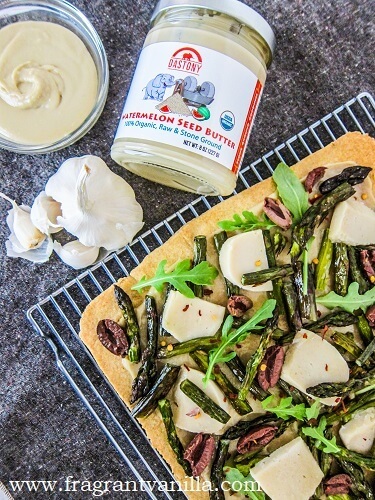 I wanted it to have a nice sauce on the bottom underneath the veggies, so I decided to use some Dastony watermelon seed butter that Raw Guru recently sent me to make a creamy garlic sauce. If you have never had watermelon seed butter, it tastes similar to tahini just a little more mild. I honestly did not even know it existed until they sent me some to try but it is good, and actually has health benefits! Perfect for people who want to make a creamy sauce but are allergic to cashews. If you want to check it out for yourself, you can find it HERE. If you do check out the Raw Guru Website, and you decide to order something, use my coupon code FRAGRANTVANILLA to get 10% off your order, typed in at your checkout. Back to that flatbread. 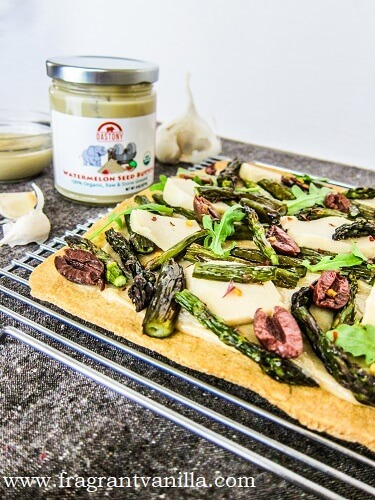 The creamy garlic sauce was the perfect thing to spread over the flatbread. I had made a whole wheat cracker crust, because that is what I like. I am not as much of a fan of doughy crusts for some reason. It is the toppings that matter to me. 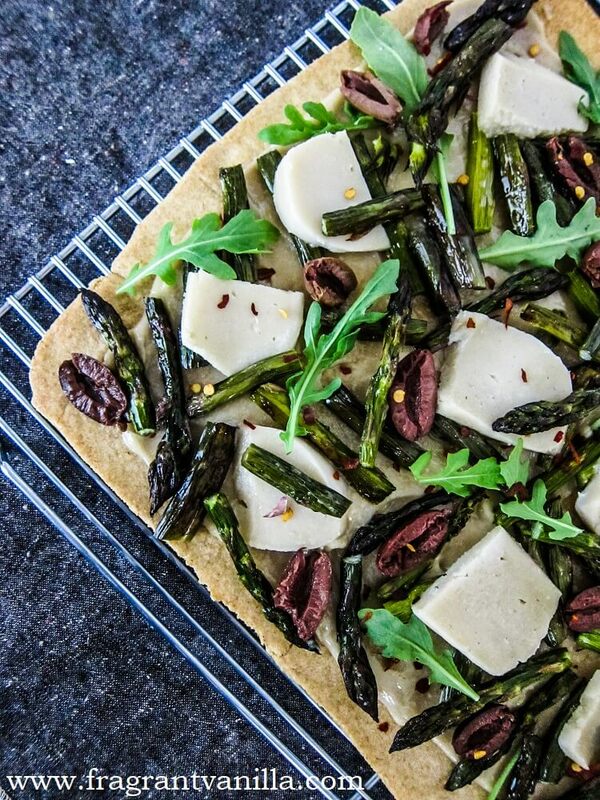 I roasted plenty asparagus, then combined it with arugula, kalamata olives, and some vegan garlic white cheddar I had made and it was beautiful. Lastly a sprinkle of red pepper flakes for garnish and it was perfect! It was a nice combination of textures and flavors, with the crunchy crust, savory veggies, creamy cheddar and garlic sauce and kick of pepper flakes. If you are in the mood for something that screams "Spring!" give this a try! To make the dough, combine the flour, and sea salt in a bowl, and whisk until well blended. Add the oil and water, and mix in until you have a soft dough. Turn out onto a sheet of parchment paper with a light dusting of flour, and roll out into a 14 inch circle. Set aside.